Blue Lizard Reptiles is one of the UK's largest reptile, aquatic and pet stores supplying everything you need for your reptiles, fish, birds, small mammals and more. We aim to have the widest choice and the lowest prices, which combined with our excellent customer service, makes a visit to our shop or websites a great experience. 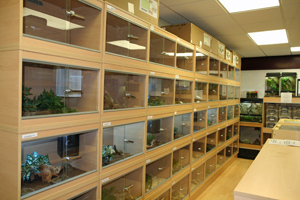 As well as our easy to use websites for reptile and aquatic products, we have a large store situated just off the M1 in South Yorkshire. 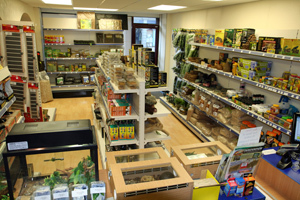 Customers are welcome to drop in and browse our wide range of dry goods, and to see the hundreds of reptiles, amphibians, fish, small mammals and birds which we have for sale in store. We are always happy to offer you advice, and to support you with your pets as much as possible, based on experience and knowledge gained through years of keeping a wide variety of animals. Our website contains a wealth of news, information, caresheets and articles, which are all freely available, and we will always try our best to answer any questions you may have about the pets we sell. Our website is custom built, which means the process of finding and buying what you need should be simple and straight forward. As we aim to have one of the widest choices of reptile and aquatic products on the internet, please don't hesitate to contact us if you have any suggestions for new products or ways in which we can make our site better for you. We aim to provide the best value on the internet, and are constantly checking our competitors and suppliers to ensure good value. If you find a product on any other online reptile store at a cheaper price than ours, then we will try to match the price. What is more, we will then endeavour to permanently match this price on our site. Our bricks and mortar store offers the same good value as we do online. We carry a wide range of products in our store, so feel free to drop in and see us if you need to see how a product works or what it looks like in the flesh. If you're travelling any distance, why not give us a call a couple of days before and we will make sure your goods are waiting for you when you arrive. We also stock a wide range of popular reptiles, amphibians, fish, small mammals and birds, as well as some more unusual specimens, and if you know what you want, we can usually find it from one of our wide range of contacts within the trade. We regularly buy more unusual animals which are imported from all over the world. Rest assured, that each and every one of our animals is treated as though it's a pet whilst it is with us, whatever it is you want give us a call. When you buy from Blue Lizard Reptiles you can be assured of a high level of customer service and professional, yet personal, care throughout. Please enjoy browsing around our site or come and see us in store. We guarantee the quality of our goods and service and we are sure you will not be disappointed.